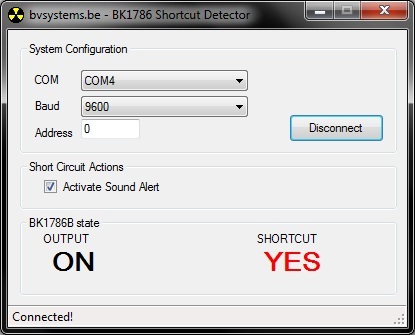 My first BK1786B application is a small tool which outputs a sound when the power supply's output current reached the maximal preset current. To do this, my software will poll the BK1786B every 100 milliseconds. It will show the output state (ON/OFF) and show if the maximal current is reached (YES/NO). Then the software also generates a sound tone, but only when you checked the checkbox "Activate Sound Alert". You don't need to set any values in the software: it only reads the data from the BK1786B unit. The maximal current is set on the BK1786B itself. You should consider this software as a small add-on for an extra functionality. Here you can download a zip with the executable and the source code for this project. The program is written in vb.net express 2010, for the .NET framework 3.5. You need to have this framework installed before you can use the software. The software comes without any warranties: it works very well on my BK1786B instrument but it was tested on a single computer only. Any feedback is greatly appreciated. The BK1786B is a programmable power supply with a current limiting feature. It will only deliver the desired output voltage when the maximal current isn't exceeded. Then the unit is in CV mode (Constant Voltage Mode), which is indicated on the LCD. Once the output current exceeds the maximal current, the unit will go into CC mode (Constant Current Mode). Now the unit will limit the output current to the preset value. It does that by lowering the output voltage to the appropriate level.